18 October 2012, Thursday night – After a long day work in your office, and coming back home for dinner is like any normal day. However, the anticipation of going for a 10 days holiday in South Korea does make the night different from other nights. We can’t wait to finish our dinner and head to the airport. Uncle & Aunt give us a ride to the airport after the dinner, and were at the airport at 8pm .. which was by far way too early for our 10.45pm flight to Seoul. Mel & Jo family message us that they just left the house when we were at the airport. Can’t wait to start our holiday, we check-in and choose to wait for Mel & Jo family in the transit hall. Bought myself an in-sole in Guardian Pharmacy, after I notice that I am wearing my Adidas shoe which has a lack of cushion for my heavy body. Not long after, Mel & Jo family arrives and we met up. 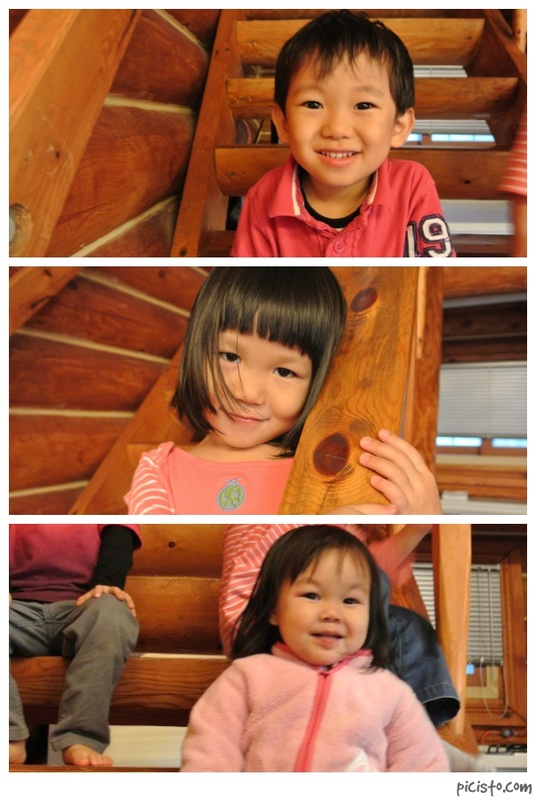 The children was have heap of fun at the transit playground. Unfortunately, Kaylene fell from the playground and have a bump on her head. By 1045pm, we were on our anticipated flight on Korean Airline heading for our much awaited holiday. Jaydon was enjoying his inflight entertainment, once we were up in the sky. I bought a USD15 kid’s headphone (from Amazon) which fit very well to the contour of the child’s head. After supper, Jaydon was getting sleepy. Change him into his pajamas and took out a pillow which we brought home (intend to throw it after the flight) and we tuck him to sleep for the flight. After a 6 hours of flight, we landed in Incheon airport. 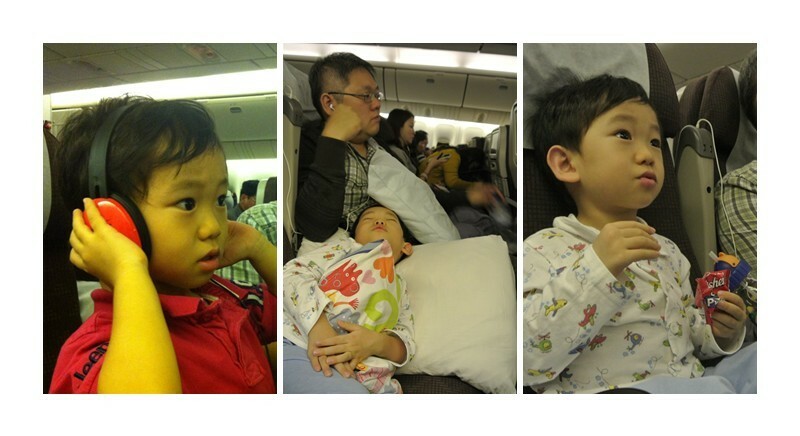 It was 6am (SG 5am), and the kids had around 4 hours of sleep throughout the flight. 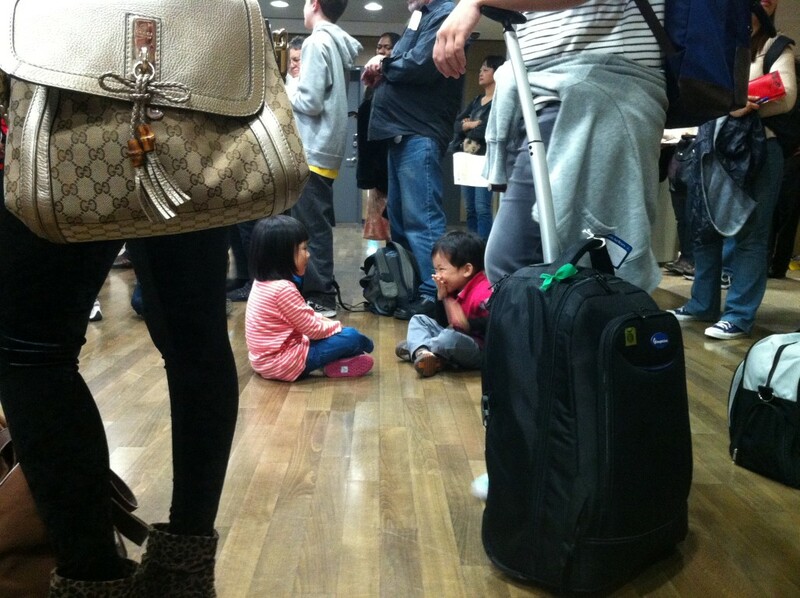 At the airport at 6am, the kid were all ready to play and run around, despite the 4 hours sleep that they had. Mom and Dad were all dazed from the insufficient sleep. After checking out from the airport, we head to find ourselves our first breakfast in Inchon Airport. 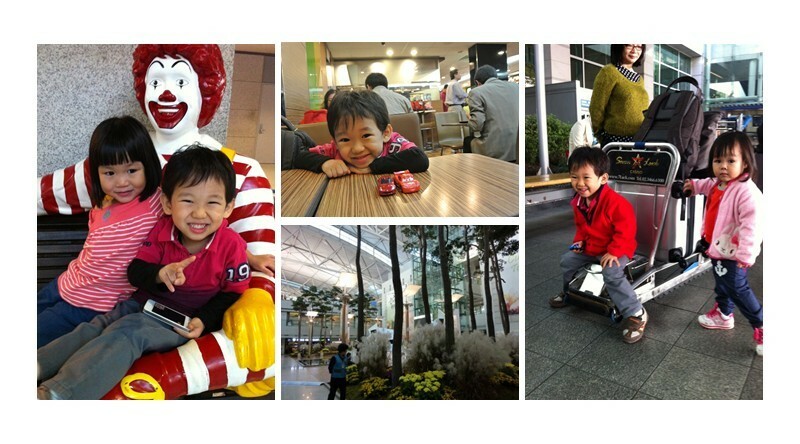 Wanted to find something uniquely nice for breakfast, but after walking from 1st floor to B1, we landed ourselves back at McDonald on the first floor for our first meal in Seoul. After breakfast, we went to the respective bus counters (arrival areas) to find the bus that can bring us to Gimpo airport for our flight to Jeju at 12noon. 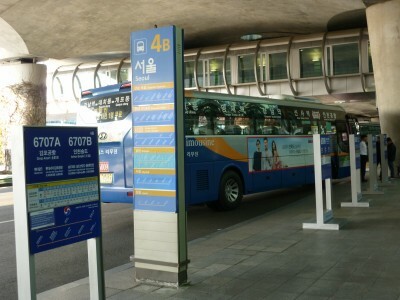 Since we received complementary Korea Airline Bus Limousine vouchers from our travel agent, we decided to use our vouchers and took KAL bus to Gimpo Airport – travel time 1 hour. We reached Gimpo Domestic Airport at 9am. With 3 hours of time left in the airport, we wander in the airport and buy snacks from the convenient store for the kids. 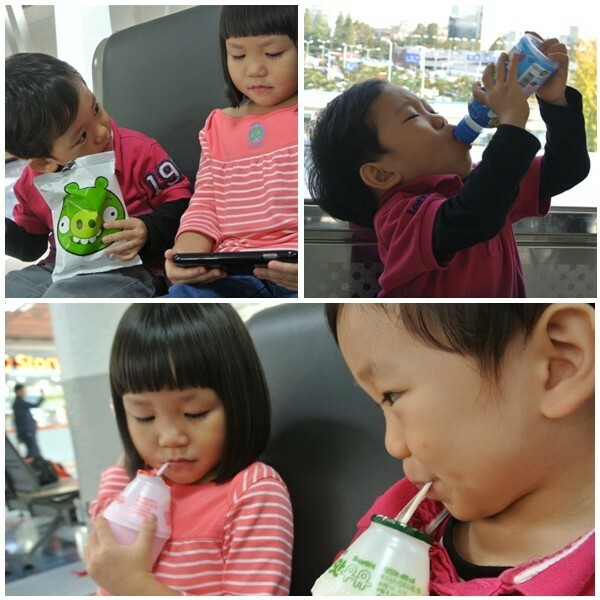 The power of ipad kept the kid entertain while waiting for our flight to Jeju. 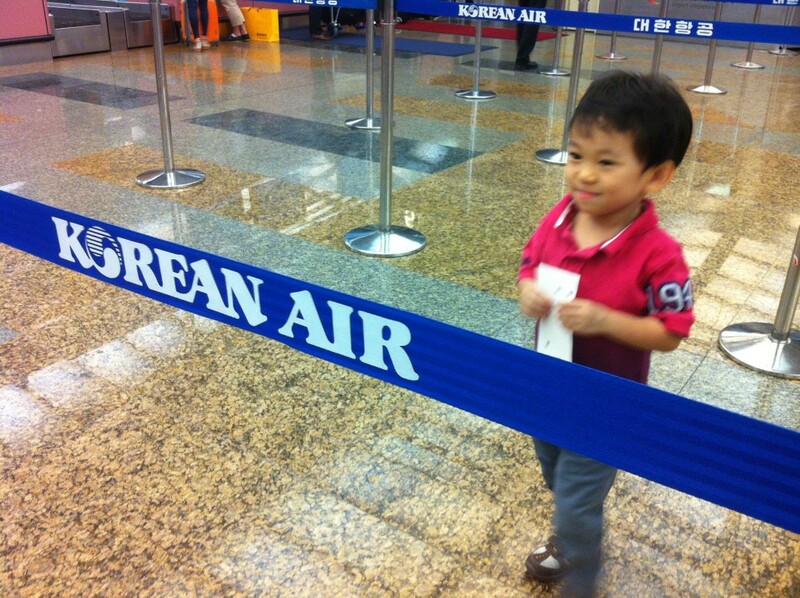 Flight to Jeju departed at 12pm and Jaydon fell asleep on board the plane. On landing in Jeju, we heads towards the car rental which is located in a separate building near the carpark, across from the Jeju International Airport. It was difficult to locate our car rental company, since there were all identified by Korean writing. However, Jo and Mary manage to find the car rental company. 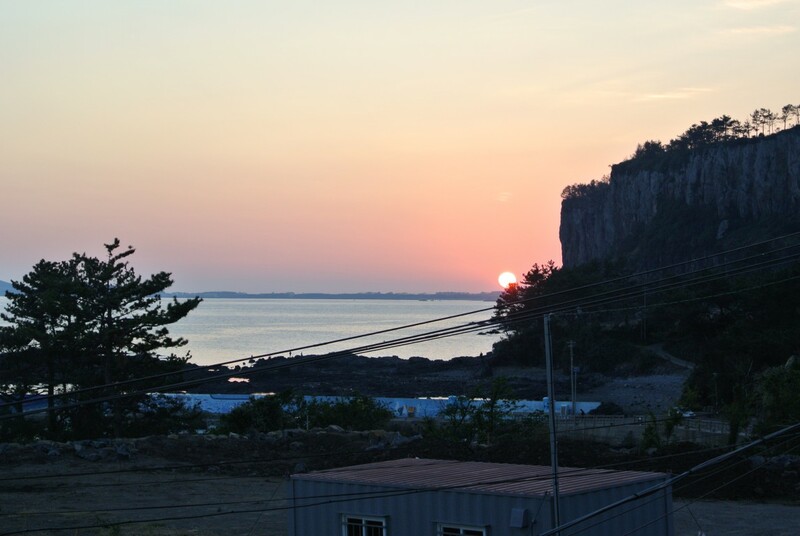 The car rental company was arranged by the owner of our accommodation in Jeju. We rented Kia Carnival 9 seater for $300 for 4 days. It was reasonable. Mel drove and the journey was 45mins to our lodge. Left hand drive take time to accustom to, but with the help with the easy-to-use GPS, we were on our way heading South towards our accommodation – Oceanlog. Property is owned by a young couple and their age seems younger then me *ENVY*. Upon reaching the lodge, we were unable to find anyone in the property, so we decided to have our lunch in nearby restaurant since everyone is hungry. 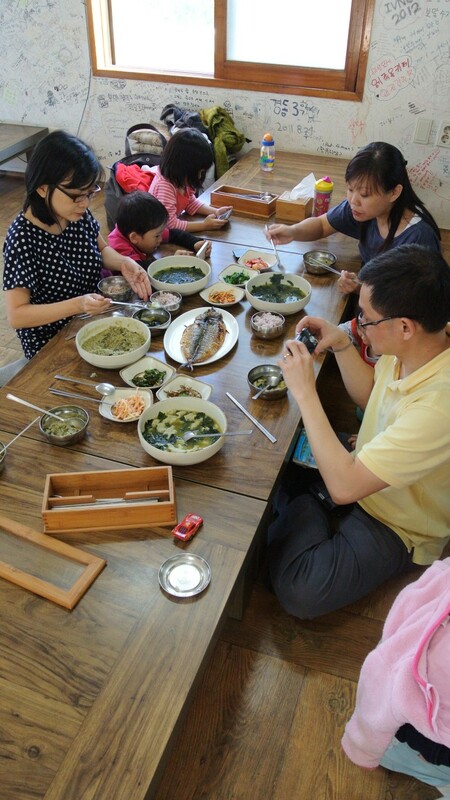 Our lunch was pure authentic Korea meal in located in a small town (or can I say village) south of Jeju – till today I do not know the name of the town/village. 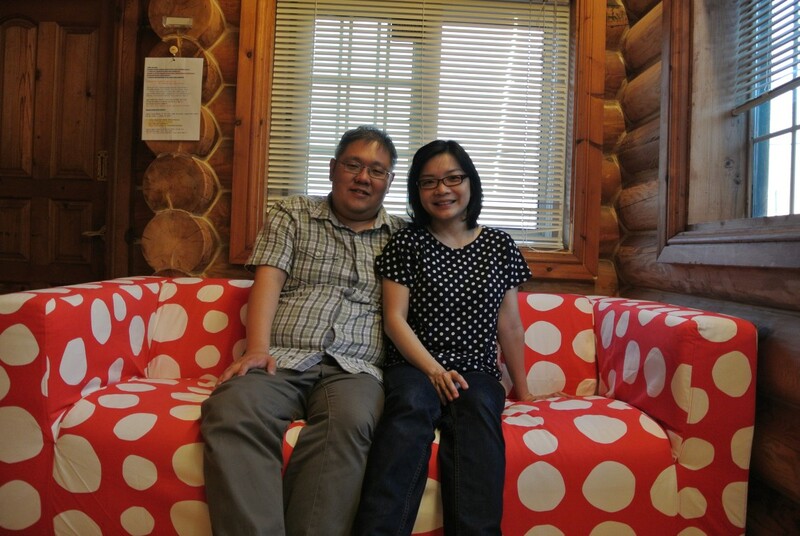 While having our lunch, we made contact with the owner of the lodge. He came soon after we finished our lunch and he led us back to the lodge. 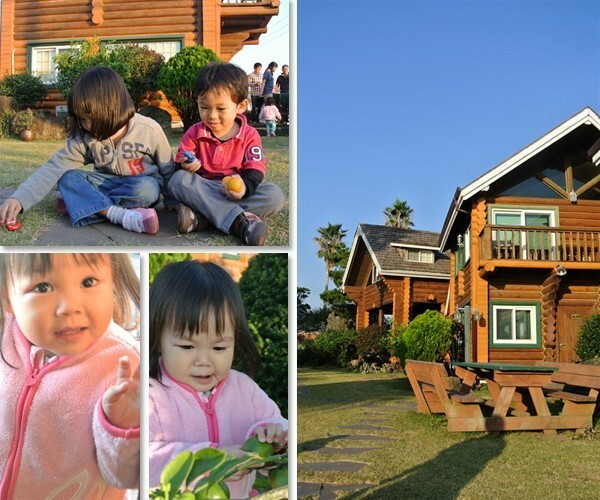 Property was nice, and it had a spacious garden where the kids were enjoying running around. 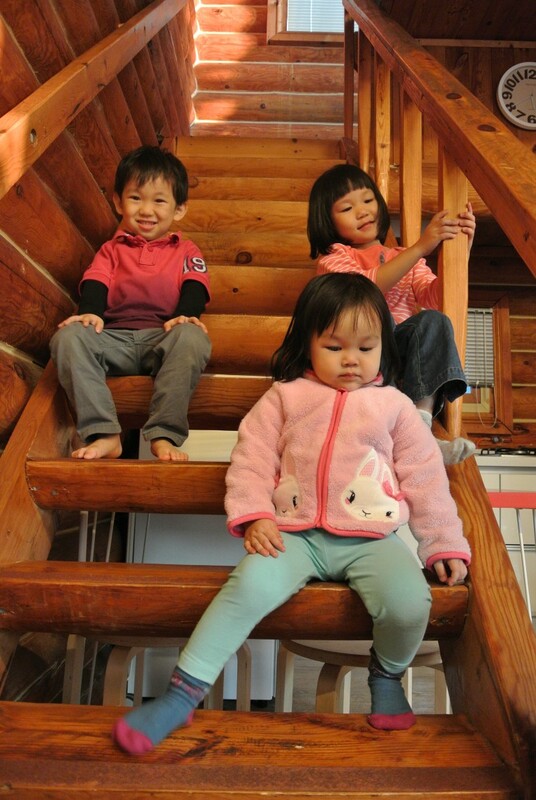 Our accommodation were 2 story log house. 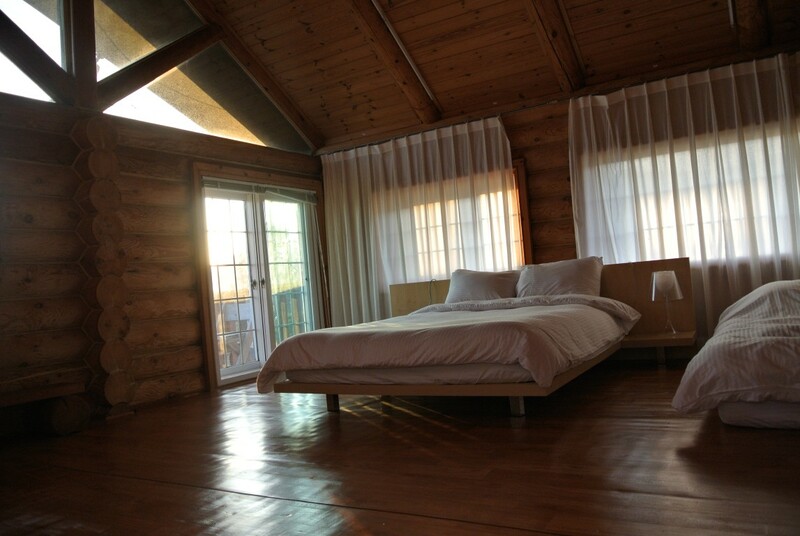 Interior was clean and we had 2 spacious queen size bed in the second story of the lodge. With the full day of traveling, we decided to relax and enjoy the tranquility of the surrounding. Our bedrooms face the sea and from the distance, we could see the small town which we had our lunch. we managed to grab some pizzas and pasta. After meal, we were all too tired and was fast asleep by 9pm.